I think there comes a time in everyone’s life when they start to remember the first decade of their life fondly. For a good ten or fifteen years, I remembered the 1980s as mostly a tacky of time overly synthesized music, big hair, gaudy colors, and acid washed jeans. The 1990s were where it was at, with all that grunge and acoustic alternative music. And then all of a sudden, in the mid 2000s, it was like someone flipped a switch in my head and I was humming along to “Africa” unironically. You know what I remember fondly, now that I’m an old man? The 1980s. (I’ve mentioned it from time to time.) 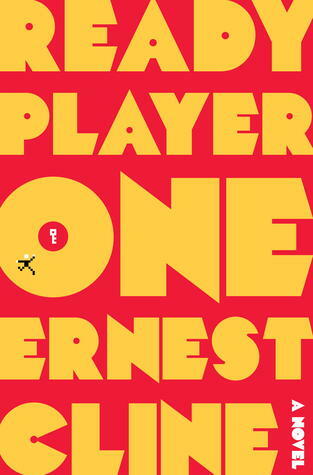 Do you know what Ernest Cline also remembers fondly? The 1980s. Coincidentally, do you know what South Park has made mildly critical of lately? Unthinking nostalgia. Well. Unthinking is probably harsh. But maybe only just. Ready Player One is Ernest Cline’s first novel; in the near future, fossil fuels have run out, the economy has more or less permanently tanked, and corporations have reached typical cyberpunk quasi-governmental status. (One of the few ways to get out of the permanent joblessness that plagues most of the world is to indenture yourself to a corporation.) The one bright spot in all this is the Oasis, an enormous MMORPG/virtual universe, incorporating, essentially, just about every fictional universe ever made, from World of Warcraft to Gundam, virtual government offices, and shopping malls. The Oasis is the brainchild of two men, one of whom disowned it; the other, Halliday, is a reclusive, fantastically rich hermit with an obsession with all things nerdy and the 1980s in particular. With Halliday as the de facto owner of the Oasis, his death of cancer casts its future in question: according to his will, ownership– and his entire fortune– will go to the first person who can solve an obscurely difficult quest that he spent the last few years of his life creating. Predictably, lots of people are interested in this, including “Parzival,” a young, penniless orphan (who only has access to the Oasis as part of his public school system) and IOI, a massive, ruthless ISP interested in “properly monetizing” (charging an access fee and slapping ads all over) the Oasis. When Parzival manages to make the first breakthrough on Halliday’s quest after years of global disappointment, he finds himself going toe to toe with a multinational corporation for control of the Oasis. Cline’s second novel, Armada, mines the same obsession with nerdiness and the 1980s that spawned Ready Player One. But where Ready Player One forsakes the real world in favor of an MMO, Armada is a conspiracy story about a secret government program making use of popular culture to train the populace to fight an alien invasion via remote controlled drones. Cline’s obsessions are more focused here on looting The Last Starfighter and Ender’s Game; our protagonist, Zack Lightman, is a troubled fatherless teen and one of the best players in the world of “Armada,” a drone combat trainer masking as a flight sim. The day after Zack “hallucinates” an alien fighter in the skies above his high school, a shuttle from Armada’s supposedly fictional Earth Defense Force lands in the school parking lot to whisk him away to fight off an impending alien invasion. In lieu of a good segue, I’m going to come out and say it: I wasn’t impressed with Ready Player One. The book is okay, but for a large portion of it, there is zero peril for the hero outside of losing his avatar to the Oasis’ permadeath. And while the antagonists don’t shy away from murder, it’s hard to really get the “fate of the world” vibe that Cline wants us to have in the race to win Halliday’s quest. The Oasis is a virtual world, and while it’s a pleasant distraction, both the book and the characters know it’s just a game, ultimately. It’s hard to feel all that invested in what is essentially one of those apocalyptica EVE Online battles that winds up costing players $30,000 in real world money. 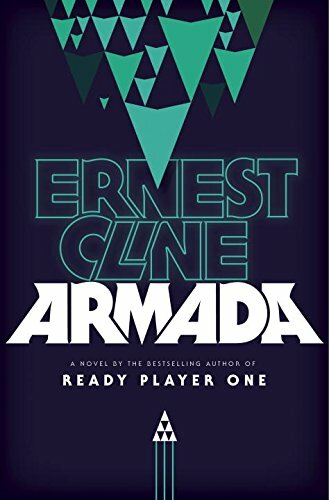 I didn’t out and out hate Ready Player One, though, so when I was looking for a another audiobook on my break at work, and Armada was available, I figured why not? It’s a library copy, nothing to lose. Armada flips the RP1 formula around, and gives the game world real life consequences– in theory. But the fact that almost everything in Armada is a remote controlled drone means that the heroes essentially have what amounts to Mario or Sonic’s extra lives. You’re shot down? There goes a $500 million drone. Good thing we have another thousand on queue. It’s the least tense alien invasion story I’ve ever experienced, and I’m including Mars Attacks and Spaced Invaders in that mix. A lot of the apparent appeal of Cline’s work seems to rest in nostalgia and his nerd shout outs; but that’s essentially all his work is. Ready Player One is Sword Art Online minus peril, plus a ton of nerd signalling (including looooooong lists of every nerdy thing possible in the narrative to let us know how nerdy Cline is); Armada is The Last Starfighter minus peril, plus a more reasonable amount of nerd-signalling. Unfortunately, when you yank out all the nostalgic references– or even half of them– it becomes apparent how thin Cline’s stories are. One question I have about listening to audiobooks is that I’m not sure how much of what I feel for the particular book is reliant on the person reading the book. Did I like the Jim Butcher’s Storm Front just because James Marsters was a good narrator? Or was it genuinely a good book? Conversely, there’s a part of me that’s wondering if my mild ambivalence to Ready Player One and mild antipathy to Armada comes from Wil Wheaton reading them. I’ve never unironically thought “Shut up Wesley” before in my life until I heard Wheaton smugly rambling off an early lecture in RP1 about how religion is delusion or Cline’s long list of nerd properties. Josh Young is a seminary student, Castalia House author (featured in God, Robot and author of the forthcoming Do Buddhas Dream of Enlightened Sheep) and blogger at Superversivesf.com. He can be reached on Gab.ai @BadgerSensei. Two Kindle Countdown offers on Superversive Press titles!